Luis Calvo Wins Event 49! 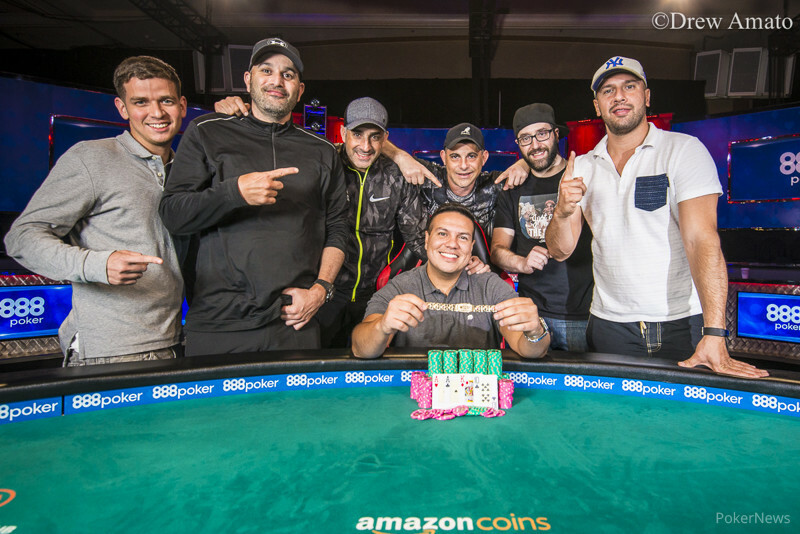 Louie Calvo came out on top of a 630-player field in Event #49: $3,000 Pot-Limit Omaha 6-Handed at the 2107 World Series of Poker to win $362,185 and his first gold bracelet. Once the official final table had been reached, the first player to be knocked out was Gerhard Schleicher, who got his stack in on the turn with two pair against Calvo's nut flush and failed to improve on the river. The next to depart was Aleksei Altshuller, who flopped bottom two pair and got his chips in against Rudolph Sawa's top two pair and got no help from the rest of the board. 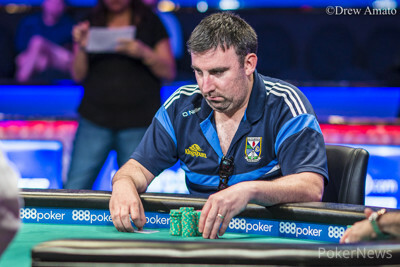 The fourth-place finisher was Eric Hicks, who entered the unofficial final table extremely short and saw a meteoric rise in his chip stack in a series of double-ups and huge pots before Calvo took the overwhelming majority of his stack in one hand and Sawa dispatched him on the very next one with aces against Hicks' pair of threes. Mark Reilly became the third-place finisher when he got his chips in on the flop with a combo draw against Calvo's pair of jacks and got no help from the deck on the turn or river. 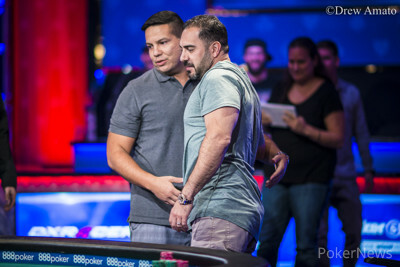 Heads-up play between Calvo and Sawa didn't last long, and it all ended when all the chips went in on the flop with Sawa holding an open-ended straight draw and eight-high flush draw against Calvo's pocket aces and nut-flush draw. The turn and river were running queens, which changed nothing for either player, and meant the pot and the title belonged to Calvo. "It's so exciting, what a feeling. I've been playing for 18 years, professionally for 17," Calvo said as he explained that he had spent most of his career focusing on cash games and had entered very few major tournaments. "Honestly, I just played my game the whole time. I picked my spots," he said with an uncontainable grin. The atmosphere at the final table started out lively and enthusiastic, thanks in large part to Eric Hicks, whose good-natured, happy-go-lucky excitement drew more than a few of his friends to join his girlfriend, who had "GO ERIC" written across her exposed midriff, in cheering for him from the rail with beers in hand. Hicks spun up quite a stack and had the chip lead at several different points before he ultimately busted, and his rail exploded with every pot he dragged. When he departed, his rail went with him and the energy around the table dropped to a lull. However, Calvo was soon joined by a star-studded rail that included his longtime friend Michael Mizrachi, who stayed until Calvo, a fellow Floridian, had finished the job. The pot-limit Omaha action at the Rio All-Suite Hotel and Casino is winding down, but the biggest events are yet to come. Event #54: $10,000 Pot-Limit Omaha 8-Handed Championship begins Wednesday at 11:00 a.m. local time, and the final and most prestigious pot-limit Omaha event of the summer, Event #67: $25,000 Pot-Limit Omaha 8-Handed High Roller, kicks off on July 5. Be sure to check back here for coverage of those and all other events at the 2017 World Series of Poker from the PokerNews live reporting team. Louie Calvo raised to 160,000 on the button and Rudolph Sawa called from the big blind. The flop came and Sawa checked. Calvo bet 200,000 and Sawa check-raised to 920,000. The rest of the chips went in the middle in a hurry and both players tabled their hands. Calvo had the advantage with his aces and nut flush draw and Salvo needed his straight draw to complete in order to keep his bracelet hopes alive. The on the turn changed nothing and neither did the on the river, so Calvo took the pot to eliminate Sawa and become the tournament champion. A full recap will be posted shortly. The first heads-up hand saw Luis Calvo apply a big pressure on Rudolph Sawa. Calvo min-raised from the button, and Sawa called to see the land on the flop. Sawa checked, and Calvo continued for 200,000. He received a quick call. The turn brought another check from Sawa, and Calvo pulled out a second barrel, sliding in 350,000. Sawa seemed calm, calling fast again. Sawa checked one more time on the river, but Calvo remained attacking. He asked for the pot size, getting 1,420,000. Then he announced he was betting 750,000. Sawa acted quickly again, but he didn't press the call button this time, sending his cards to the muck. With the first hand going his way, Calvo increased his lead to exact two-to-one advantage. Mark Reilly raised to 175,000 from the button and Louie Calvo called from the big blind. The flop fell and Calvo checked. Reilly bet 225,000 and Calvo made a pot-sized check-raise to 1,065,000, sending Reilly into the tank briefly. He ultimately shoved and Calvo called to put him at risk. Calvo had the advantage with his pair of jacks and Reilly, who held the nut flush draw and an open-ended straight draw, needed help from the deck to preserve his tournament life. The turn and river changed nothing and Calvo took the pot to end Reilly's deep run in this tournament. Louie Calvo opened to 175,000 from the button and Rudolph Sawa called from the big blind. The flop came and Sawa checked. Calvo bet 250,000 and Sawa called. The turn was the and both players checked. The fell on the river and Sawa checked. Calvo bet 575,000, Sawa folded, and Calvo took the chips. Mark Reilly limped from the small blind and Rudolph Sawa checked his option. Reilly decided to peel on the flop, but Sawa accepted the 85,000-bet. The turn brought a possible flush, and Reilly fired another 175,000. Sawa called again. Reilly saved the third barrel and checked the river instead, but Sawa wouldn't let him see his cards for free. He bet out 375,000 and while Reilly gave it a brief thought, he eventually mucked. Rudolph Sawa is still leading, he'll enter the next level with 53 big blinds while Mark Reilly is on 38 big blinds and Luis Salvo on 28 big blinds.